Our first style is patchwork skirt. This is one of the hottest and famous trends right now. It’s an ideal choice for cold seasons. This design Is slightly warmer than your usual fabric. Most of them are made of thick materials, like denim and suede. Here we see a model who appears on the streets wearing front buttoned multi-checkered mini skirt worn with blue chambray shirt and lovely flat pumps. Speaking of suede, then you should try on skirt made of this fabric. This is a warm and functional material that is widely used in warm clothing. Personally, I feel a kind of retro touch in suede made apparel. When I see suede outfits I automatically start to think of 1980’s and 1990’s fashion. So, those of you who want to wear retro looks, then you are welcome to try on suede skirts by teaming them with your lovely tops and blazers. Another great skirt is the one that is made of denim. This material is the best one. Why? It can be used in so many styles. For instance, you can create awesome glamour, retro, grunge, tomboy looks, all you need is to know the right combination. In other words saying, denim works with everything. This fabric is wearable all year long. 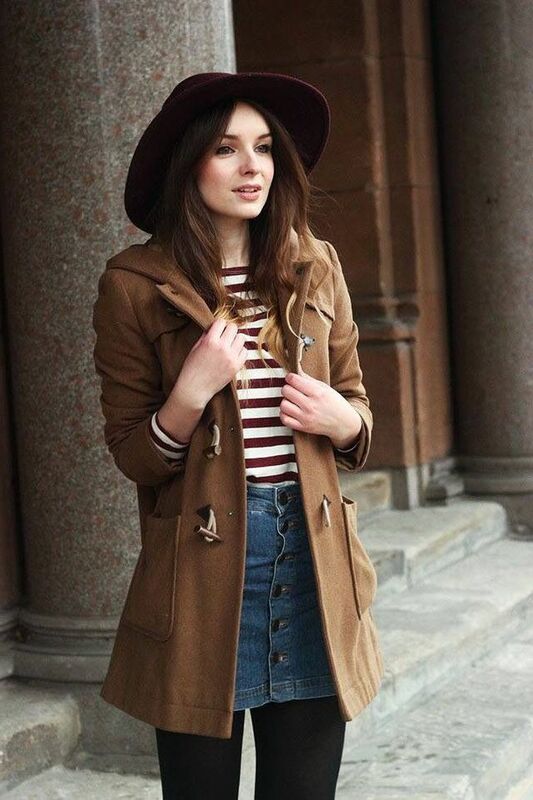 If you are in love with casual and relaxed looks, then you can try on this beautiful skirt and pair it with striped tops and classic coats, or keep things sophisticated by adding black turtleneck, beige-khaki cape-coat and dress it up with fancy accessories. 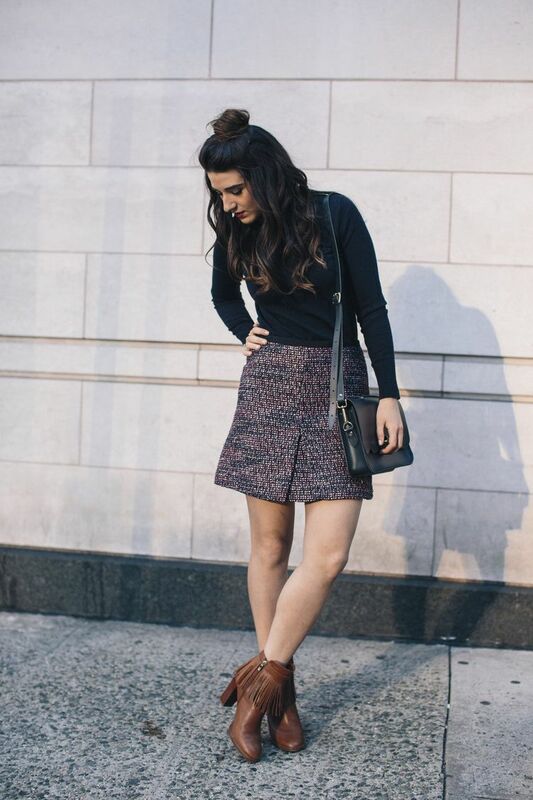 Another functional skirt is the one that is made of tweed. It’s really thick fabric that works ideal for winter time. For instance, you can try on tweed skirt and wear it with your favorite blouse or pullover and complete the look by adding tailored blazer, tights and classic pointed-toe pumps. This is an ideal piece to wear from Mondays to Fridays at work. Another stunning material for skirts is leather. It’s just like denim, you can wear it all year round, while the best season is of course fall and winter months. 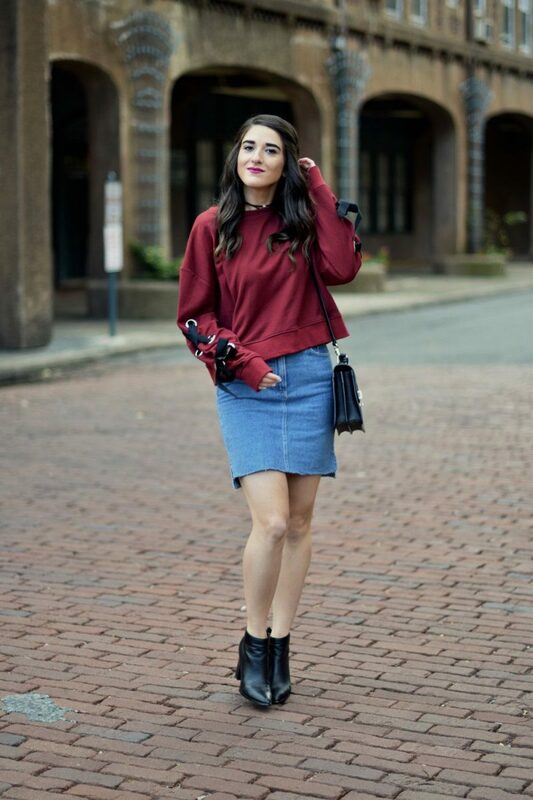 Try leather skirt with slim turtlenecks or relaxed fit sweaters. If you don’t mind what is the fabric of your skirt, then you should try on maxi skirt. Yes, it’s an ideal design to wear in winter time, as you can wear another skirt or leggings underneath this maxi garment.